Rustic Antique Pine bench features reclaimed pine. Our Custom Artistry antique furniture features Mexican Reclaimed Pine Wood. This simple yet elegant bench is one of our Mexico bestsellers. It is a fantastic addition for pretty much any room in your Mexican home. Reclaimed wood is a durable, environmentally friendly resource that brings great warmth, charm and history into your living environment. 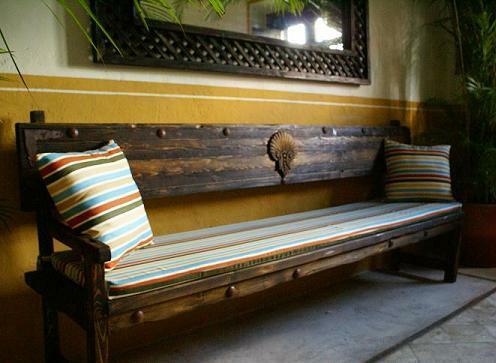 This bench will be equally at home in a grand Mexico colonial bedroom, a warm and inviting living room or a beautiful office or gallery space. Cushion can be upgraded to Sunbrella fade-and-stain-resistant fabric. Because of nature and variety in recycled pine, photo and video only represent the finished product.